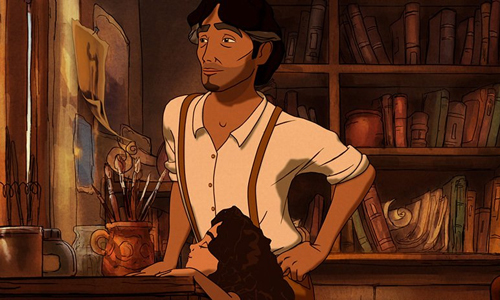 Kahlil Gibran's The Prophet is a beautifully-constructed, ambitious piece of animation with an identity problem, uncertain as to which type of audience it should appeal to while adapting the author's collection of essays and poems. It'd like for younger viewers to be drawn to the capricious main character and her interactions with a town's citizens, offering a child's perspective into the topics touched upon by the titular scholar, while adult audiences should be entranced by the author's lyrical prose about philosophical and existential musings as they loosely connect with the story's events. Beautiful imagery and music of varying types accompany these episodic reflections, offering an eclectic visual experience that could engage both age groups and attention spans. Through the passionate intentions of producer Salma Hayek and coordinating director Roger Allers, this modified take on Gibran's celebrated text respects its casual pacing and segmented artistry, yet that ultimately produces a sluggish and inconsistent cinematic experience that inadequately engages both sides of the audience aisle. The Prophet gathers together the works of Gibran and fits them within the story of young Almitra (Quvenzhane Wallis), who hasn't spoken since the death of her father. She's a problematic young girl despite her silence, who frequently causes commotions in her seaside town that her mother, Kamila (Salma Hayek), must find ways of fixing between her shifts as a housekeeper. One day, Almitra pulls a fast one on her mother, following along to her place of work instead of going to school, and Kamila reluctantly allows her daughter to join her for the day. The young girl's mischievous nature leads her to meet Mustafa (Liam Neeson): Kamila's "boss", a writer and artist, and a political detainee within their city. It's here that the recognizable elements of Gibran's story emerge as Mustafa learns of his coming freedom, leading to him being escorted outside his domestic prison and toward a boat leading to his homeland, where he interacts with the local people and conveys meaningful stories about the things he sees and about the reverence they have for his work. Given poise and emotional gravity by Liam Neeson, each of these verbalized stories segues into portions of Kahlil Gibran's book, accompanied by vivid and distinct animation that varies between each part. Ranging from blatantly surreal transformations of animals and people to the abstract realism of a tango dance, The Prophet deliberately shifts artistic gears between each one, giving the audience a cornucopia of styles -- minimalist, painterly, erratic pencil strokes -- to feast upon throughout the 80-minute story, and it's always stunning to look at between the cel-shaded narrative holding it all together. Unfortunately, the two storytelling methods clash with one another as a complete narrative, with the largely straightforward story of Mustafa's stroll through the coastal city and interactions with the townsfolk feeling interrupted by these avant-garde insertions, instead of enhanced by them. That's part of the intention, to transport the point-of-view into different aesthetic settings with specific tonal intentions, yet it's too jarring against the quaint profoundness of the poet's reflections amid his leisurely stroll to freedom. For younger audiences or the impatient, the pacing and purpose of The Prophet will likely prove unsatisfying since the stunning imagery relies on engaging a wealth of underlying metaphors for it to carry any real meaning. The topics are as diverse in subject matter as they are within Gibran's works, ranging from motherhood and true love to the meaning of death, all heavier focuses that aren't handled in ways that are conducive to passive entertainment. In a way, The Prophet reminded me of Disney's Fantasia in structure and progressive rhythm, only on a much more highbrow -- and inaccessible -- level considering the insistently conceptual nature of each segment. Scenes of archery bows transforming into pregnant woman and dolled-up, stoic dancers running their bare feet on glass shards convey their respective points, but they don't resonate much beyond the surface, trying too hard to be creatively expressive without gelling together with the context of the Neeson-voiced texts. This takes up a significant amount of The Prophet's energy, something that might not be expected considering the conventional, family-friendly emphasis on Almitra at first. Understandably so, her story feels tacked onto the rest of Mustafa's journeys traversing between the townspeople, reaching a predictable conclusion to her story as she builds an affinity for the political prisoner and his strife. Despite the handsome visualization of the location and the suitable voice work from the likes of Salma Hayek, John Krasinski, and Alfred Molina, there's something strangely inert about this narrative vehicle and its inability to enrich the poetic inclinations of the vignettes, creating an experience that cannot reach its intended thought-provoking heights. One's enjoyment of The Prophet will ultimately come down to how eager they are to latch onto the individual artistry of its disparate parts, not the complete package of Mustafa's journey and how he impacted those around him. While there's pure creative enjoyment to be had there, it doesn't work as the inspirational celebration of life and existence that it strives to become.